3. Use a No. 2 Phillips screwdriver and loosen two metric screws holding the stand and remove the stand from the monitor. 4. Store the stand in the original box. 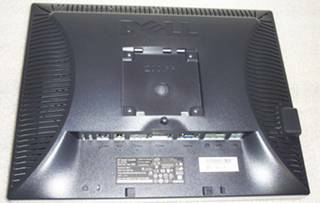 In case of warranty service, you will need to put the monitor back into its original configuration. 5. The upper cross bracket has been pre-installed to minimize any vertical gap. If an adjustment is needed, then use a ¼” socket wrench to loosen the 4-40 locknuts to realign the cross bracket. 6. 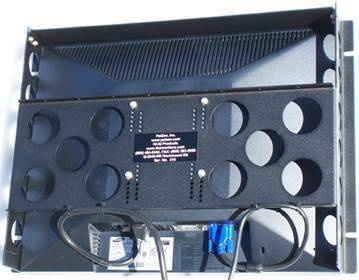 Place the Q-100mm-2 (.50” X 4.50” X 0.25”) PVC spacer block over the 100 mm-center VESA mounting holes in the back of the monitor. 8. 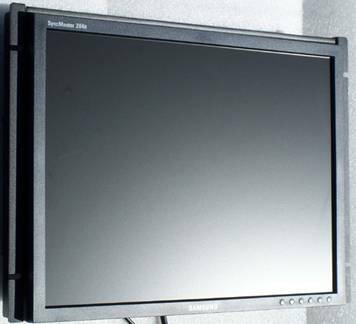 Position the Q-2040-RK over the monitor for the best fit. Insert a 4 mm X 20 mm metric screw with No. 8 lock washer and No 8 flat washer into each one of four VESA mounting holes. First hand tighten, then securely tighten all four screws. 9. 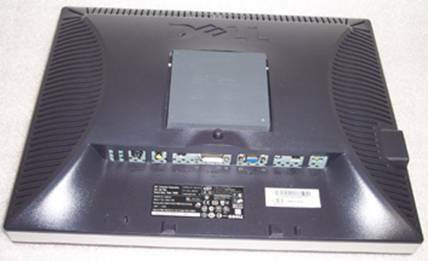 Insert the VGA cable and/or DVI cable(s) and the power cable. Use the 5” tie wraps to secure the cables using the holes on the lower flange of the Q-2040-RK. Trim any excess length of the tie wraps with an angled wire cutter. Photos of the Samsung 204B-Black mounted on the Q-2040-RK. 10. The assembly is now ready to be mounted onto a 19" rack. Use the 10-32 X 3/4-inch black screws provided. 11. If you have any questions or comments, please call Harry Lee, 805-484-2454 or e-mail to hlee@flatmonitors.com.